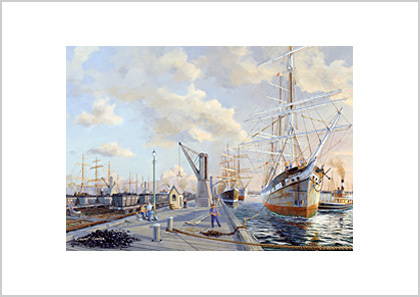 The ship Wavertree, built 1885 is moved alongside the coal loading wharves at the Dyke in the Port of Newcastle, New South Wales. The Dyke was a long neck of reclaimed land facing the entrance to the Hunter River on the eastern shore of what was once Bullock Island. Reclamation has resulted in the area being renamed Carrington. This painting was inspired by numerous stories told to me by those who experienced life under sail and who had taken part in the ritual of loading coal at Newcastle. Sailing ships that had discharged their inward cargo in Sydney and had secured a coal charter were usually towed up to Newcastle in ballast, as it was not worth trying to sail. This was not intended to save the labours of the crew. A tug would be required to take the sailer out of Sydney Harbour and also to bring her into Newcastle anyway and this distance could usually be covered in 24 hours. It was also likely that many in the crew had ‘jumped ship’ in Sydney so no more crew would be needed until the sailer had loaded in Newcastle and was ready to depart. On arrival at Newcastle the bar at the entrance to the port had to be crossed. The bones of many ships lie in these sands, the result of bad weather and a tug that was unable to overcome the effects of wind and tide. When the sailer was towed in from the sea she was usually taken to Stockton on the northern shore of the river entrance where her ballast was discharged. In 1907 over 2 million tons of ballast was dumped. This ballast was used to reclaim large areas of the Stockton and Bullock Island foreshore and much of the rubble from the 1906 San Francisco earthquake ended up here, brought by sailing ships, unable to get a cargo out of that port. This ballast was provided free and I have been told of human bones being found when this ballast was dug out. To maintain a sailing ship’s stability, some coal had to be loaded before all the ballast could be removed. In the early 20th century there could be 100 sailing ships in port waiting their turn to go under the coal tips. At Stockton as well as the Dyke and Kings Wharf, they could be moored three abreast and stretched for several kilometres along the Dyke. When a berth became available the sailer was moored adjacent to one of the hydraulic cranes that lined the wharf with its rail lines and their rows of coal trucks. The coal truck was actually a hopper on wheels. Containing 7-8 tonnes it was lifted off its bogie and swung over the hold and the contents released by pulling a pin on the underside by a man known as the pin boss. Men known as trimmers shovelled the mound of coal that built up in the hold out into the wings. Two of these can be seen in the painting, yarning in the foreground. The coal was humped up in the centre to raise the centre of gravity otherwise the ship would become too ‘stiff’. Precautions were taken to prevent the coal ‘shifting’ in heavy seas. Longitudinal shifting boards were fixed to the ‘tween deck stanchions above the keel and the load covered with tarpaulins and old sails tommed to the sides and deck head. In spite of this it was not uncommon for the load to shift. The only course of action possible was for the crew to get below and shovel the mountain of coal back. Lumps of coal that fell from the rail wagons was collected by enterprising individuals and some sold cheaply to shipmasters as fuel for the galley stove or donkey boiler. When loaded, the sailer was moved to buoys, known as the ‘Farewell Buoys’ inside the entrance to the Hunter River. This allowed a day or two to bend sail (always removed from the yards when in port to prevent their becoming impregnated with coal dust) and to clean up the coal dust that found its way into every corner of the ship. New hands joined the ship at this point to replace deserters, including some still in a drunken sleep. Newcastle, one of the world’s great sailing ship ports was second only to San Francisco for the practise of ‘crimping’ and ‘shanghaiing’, well into the 20th century. ‘Crimps’ were the labour brokers of the day and they supplied seamen to ships about to depart. They were usually obtained from arriving ships a day or two previously. During a drunken run ashore seamen were induced to jump ship on the promise of a better ship and higher wages. I was told of one seaman waking up in the foc’s’le of his own ship after being drugged by some crimp who had targeted him in waterside bar. Wavertree was dismasted off Cape Horn in 1910 but was able to reach the Falkland Islands where it was decided that it would be too costly to re-rig her. She was towed to Punta Arenas where she spent 37 years as a wool barge. She was then taken to Buenos Aires for use as a sand barge. It was here that Karl Kortum found her in 1966 and due to his efforts was acquired by South Street Seaport Museum, New York. 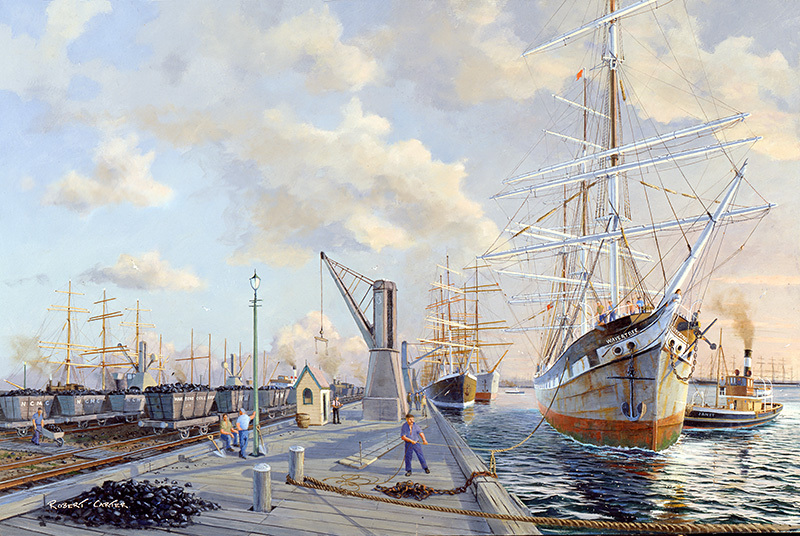 Wavertree being move alongside the coal-loading wharves at the entrance to the Hunter River. Wavertree was dismasted off Cape Horn in 1910 but was able to reach the Falkland Islands where it was decided that it would be too costly to re-rig her. She was towed to Punta Arenas where she spent 37 years as a wool barge. She was then taken to Buenos Aires for use as a sand barge. It was there that Karl Kortum found her in 1966 and due to his efforts was acquired by South Street Seaport Museum, New York. A 13-million dollar restoration was completed in 2016 and she is now on display.